The British Prime Minister is steering in the sensitive negotiating point, reports by “Bloomberg”. Still waiting for confirmation. demand for the planned withdrawal from the European Union. 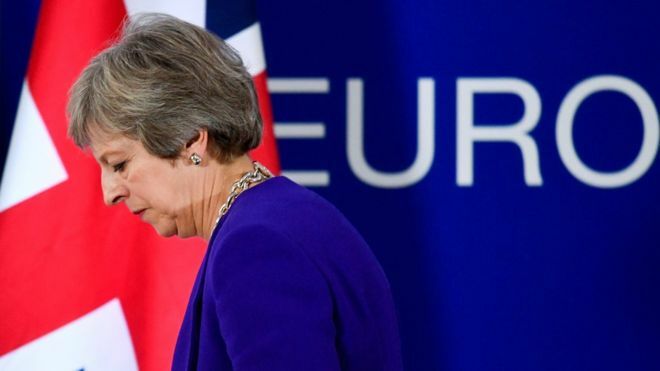 Prime Minister Theresa May and her team would now accept that after the end of a Brexit transitional period, Northern Ireland will initially remain in the EU economy for an indefinite period of time, the Bloomberg agency reported on Friday, citing insiders. May wants to accelerate the Brexit exit negotiations. The office of the head of government did not want to comment on Friday evening. May said in a teleconference with business executives Friday that the “backstop” idea of remaining in the EU of Northern Ireland would be temporary. The 500-kilometer border between the EU-owned Ireland and the UK-based Northern Ireland has been open for years. It is controversial of what happens there at Brexit because Northern Ireland is no longer in the EU and the border with Ireland, therefore, becomes the EU’s external border. People and goods would have to be checked again, which Ireland does not want. May has therefore proposed a customs and trade agreement to be agreed after Brexit at the end of March 2019 in a 20-month transitional period. However, as a safeguard against the failure of this project, the EU calls for a clause in the Brexit exit treaty stating that Northern Ireland will remain in the EU economic territory indefinitely until there is a better solution. Britain, however, fears new customs controls between Northern Ireland and British territory. impression at the EU summit this week that the EU countries wanted an exit agreement as soon as possible this fall. However, at the summit, the view prevailed that more time was needed for the negotiations. From the planned EU special meeting in November, in which the Brexit deal should be finally sealed, was not discussed in the speech. According to EU chief negotiator Michel Barnier, the deal must be completed by December to avoid unregulated Brexit.